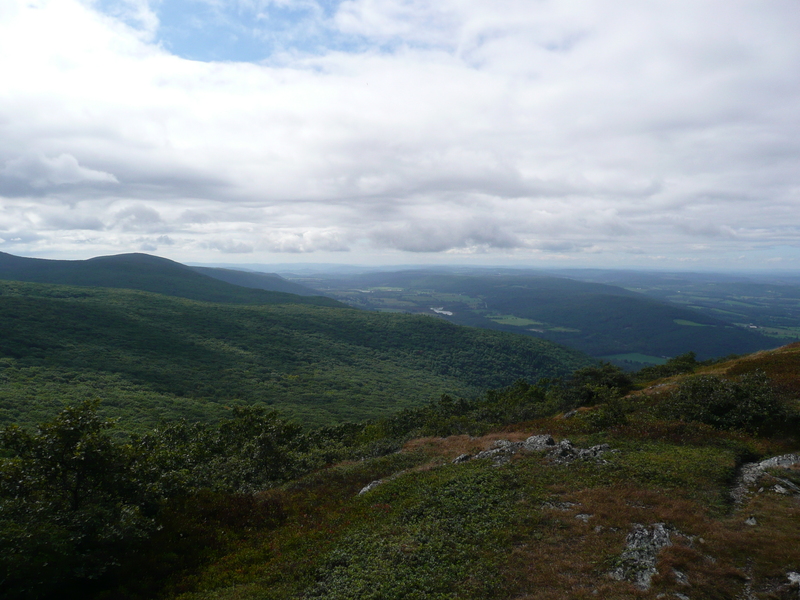 The Alander Mountain loop trail in Massachusetts and New York was one of those trails that steals your breath away for its stunning views, scary creatures and varied terrain. 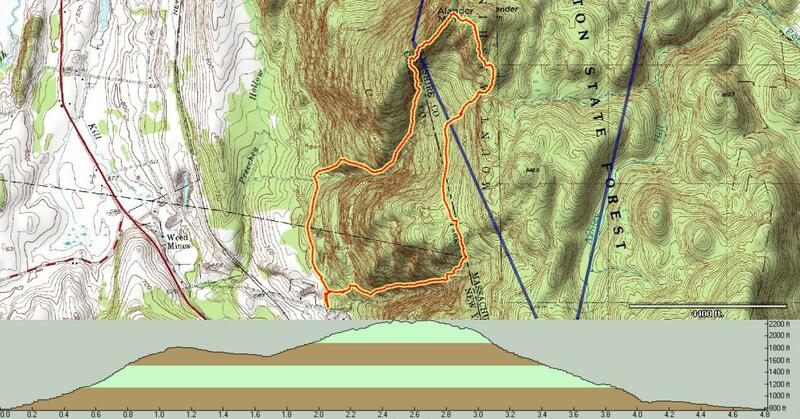 We started on the Robert Brook Trail, where we ascended 1,000 feet in 1.1 miles. 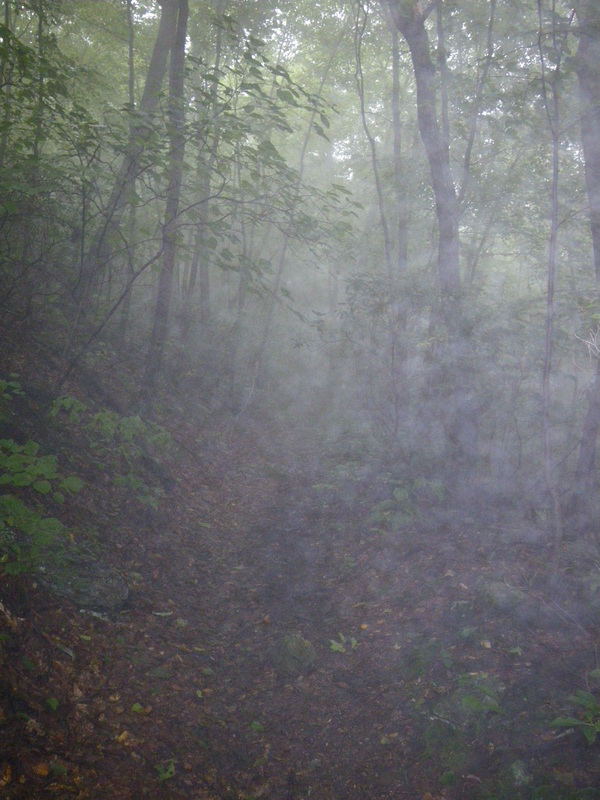 We were hugged in by fog on the start of this trail. The foggy appearance gave the forest an eerie feel and we wondered when we would be able to escape its grip. Luckily the fog didn’t last long, or we would have missed the granite marker denoting the boundaries of New York and Massachusetts. 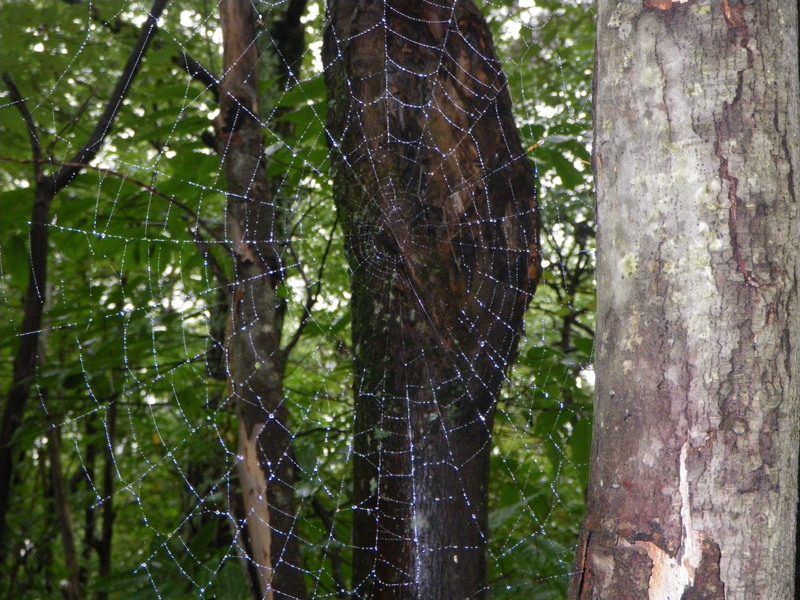 If the fog had not dissipated we would have stumbled right into this web with the very scary worker building it. 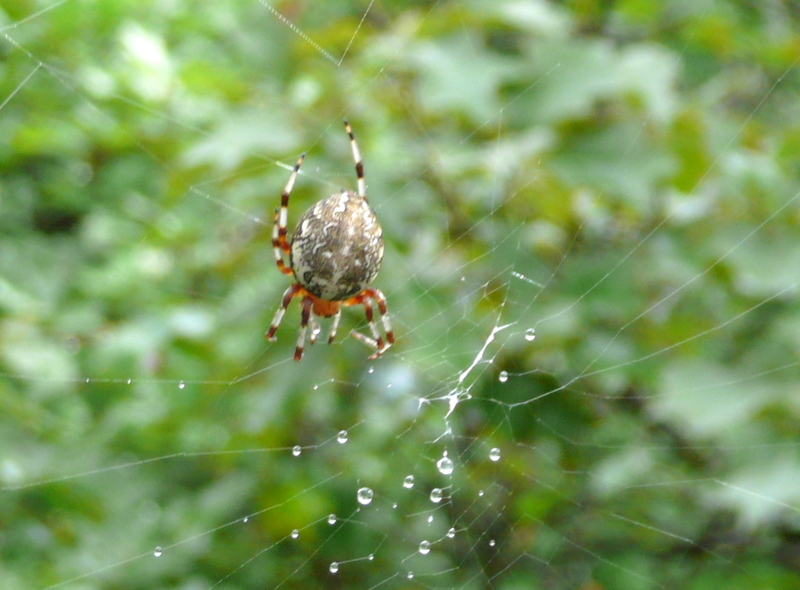 Just thinking about being encased in a web, gives me the shakes. We turned right on the South Taconic Trail and followed an old woods road. 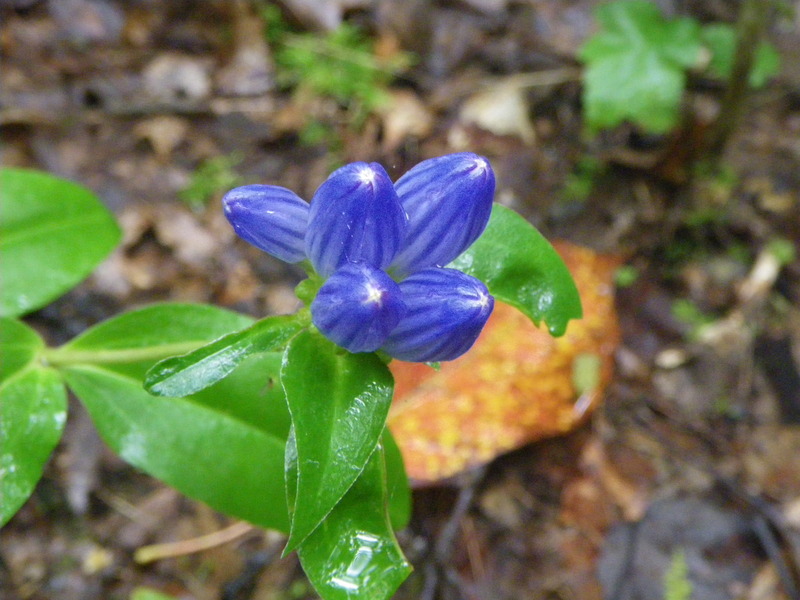 Along this road trail we discovered a true blue flower, amazing fungi and another horror movie looking spider building his web. The woods road turned us onto the small trail leading us to a narrow trail inside Mount Washington State Forest. We started to go up again, scrambling up some rock. I was in the lead when I came upon the largest snake I had ever seen in its natural surroundings. 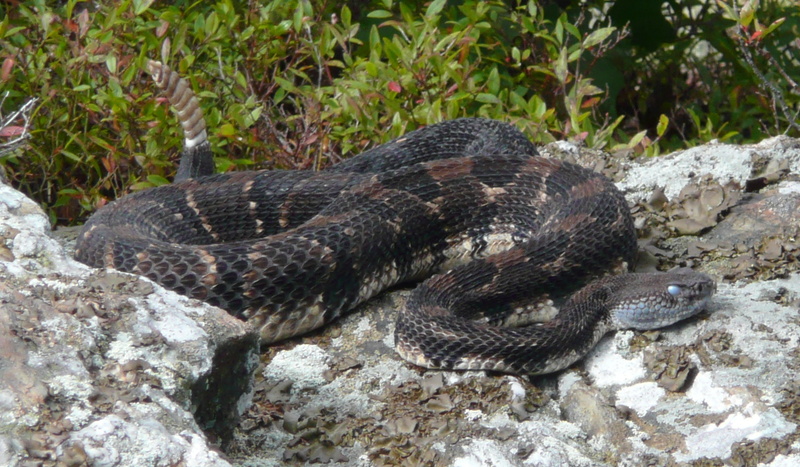 When Mike caught up to me, he examined the scene I had stumbled upon and corrected my statement, “These are the THREE largest RATTLESNAKES I have ever seen.” Ok, the one snake I first viewed was actually two intertwined and the third one, I completely didn’t see was off to the side. A new feeling started to overtake me. I was scared, excited and intrigued all at the same time. 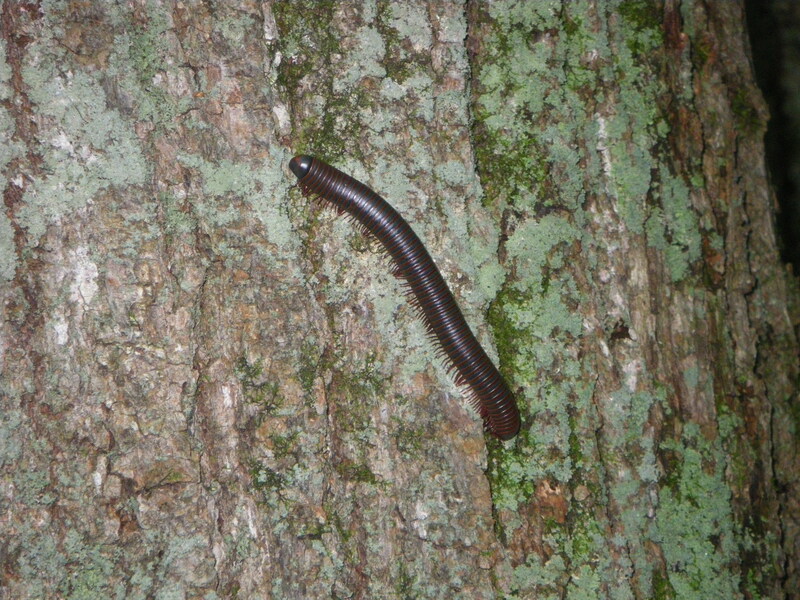 Here is a fearsome creature, leaving us breathless, but yet we wanted to watch and photograph these slithery beings. It was a cool morning; they were still a bit lethargic so we were able to photograph away. When one of them had enough, he raised his tail and before he had the chance to shake his rattle, we quickly dashed out of their way. With a bounce in our stride, but with watchful eyes on rock faces we continued on our way to the summit of Mount Alander. What else would take our breath away on this trip? Soon we had the answer to that question. The views from the summit of Alander were spectacular. We were able to see Mt. 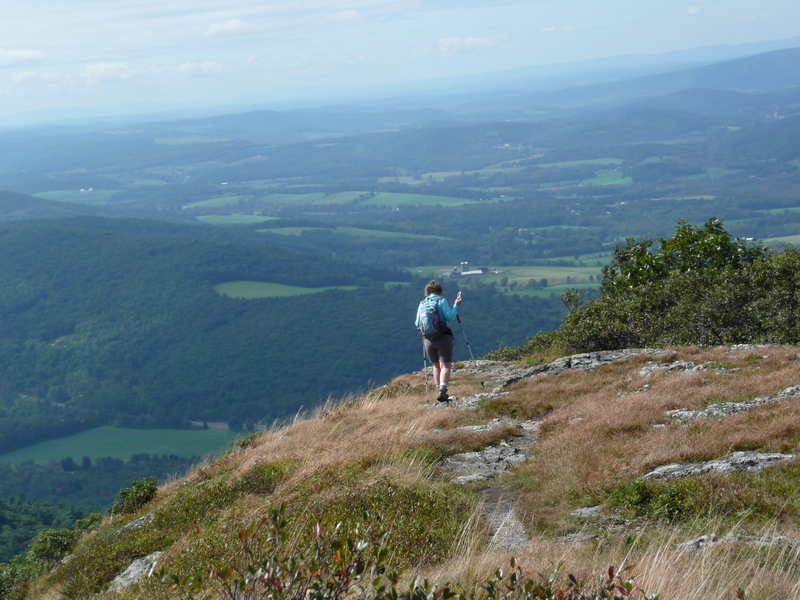 Frissel, Brace Mountain, the Hudson Valley and hills that just kept rolling on. We descended down, after having our snack and playing around on the vast summit. Towards the end of the trail we walked another woods road, next to open fields on our right and a heavily forested area to our left. Looking across the fields you could see more rolling hills in the distance. Into the greenness of the forest, I wondered what beings lurked, watching us head out of their woods. With one last dangerous insect, saying good-bye to us, we exited out of the woods. 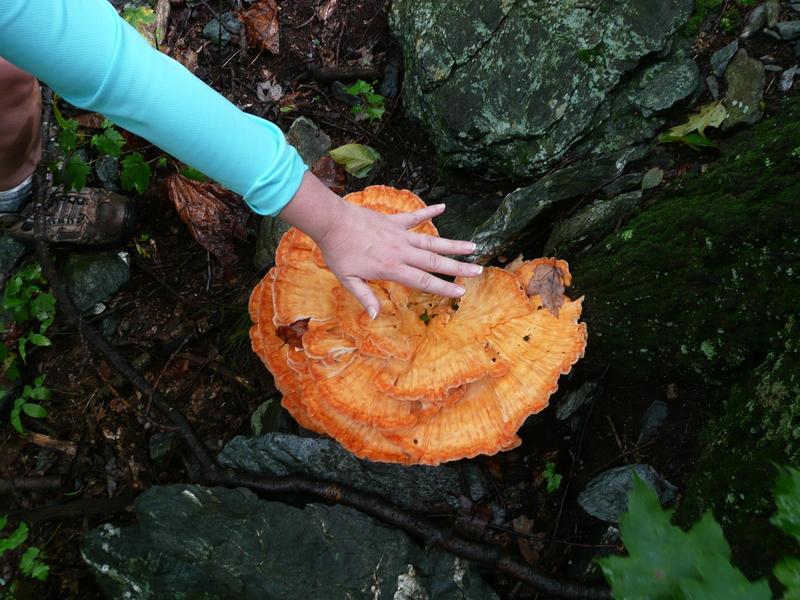 This hike had it all the elements to take our breath away: Stunning views of valleys, mountains and hills, animal life both beautiful and deadly at the same time, and finally the sense of peace, being in the woods brings to one’s heart. The Details: Great cardio hike, with lots of ups, especially the first mile. 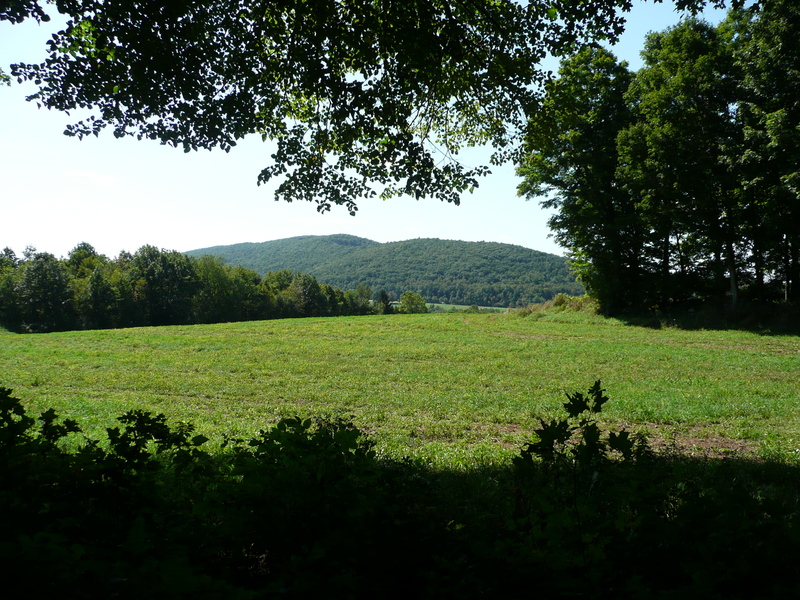 We started off at the Robert Brook Trail in New York, a little turnoff next to the road. 4.28 mile loop, 3 hours 45 minutes of moving time. Overall speed 1.3 mph. Non moving time over an hour. Is there an address for this trailhead? And is overnight parking permitted? Shannon, (almost a year later) the trailhead is on Under Mountain Rd., no overnight parking on the NY side. Mt Washington Headquarters on the Mass side of the mountain has overnight parking and about 7 backwoods campsites 1.5 miles in and halfway to the summit. Can also camp in the cabin close to the summit, but it is absolutely filthy and full of trash. On 6/11/16 my girlfriend hiked the Alender Mountain in the Washington State Forest. 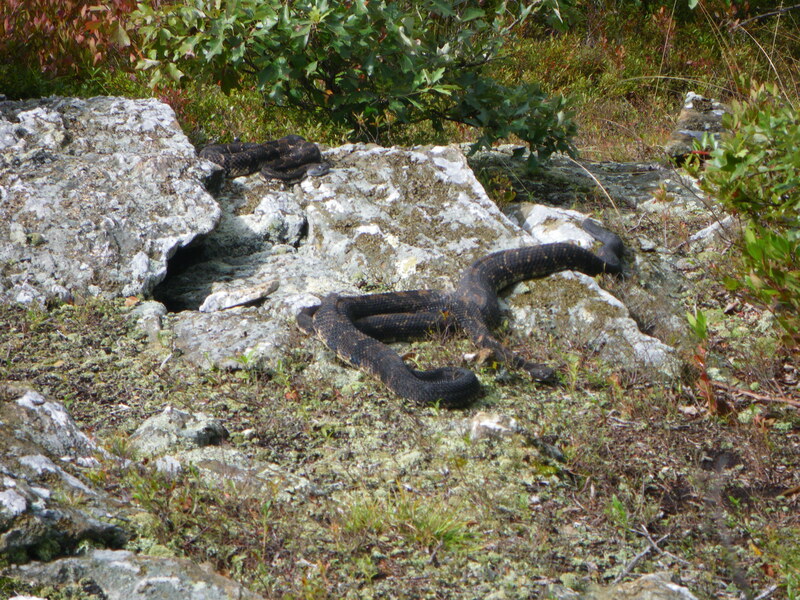 Early in on our hike we walked up on approximately 12 huge Rattlesnakes. The snakes were low key & we made it past them with out incident. After hiking all-day in a different area, we walked up on approximately 8 more rattlesnakes that were a-little more aggressive. The snake closest to the path was rattling away & head cocked back. We eventually made it past but a little shaken. Great hike but stay alert!! CTHikergirl, there are actually five or six snakes in your picture!! look at the rocks in the top right of the photo. I hike this exact trail often, but I don’t recognize the rocks. I’ll have to keep an eye out for them. I’m guessing that’s towards the top of the blue trail. nice write-up.